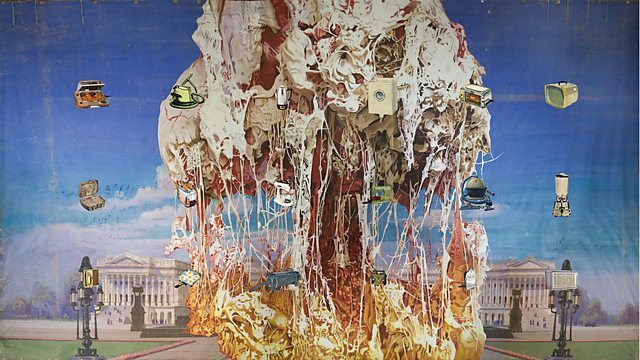 American artist Jim Shaw on the links between a prog rock opera, an invented religion and the economic downturn. A big survey of his art opens at Baltic in England this week. The best of the world's arts, film, music and literature brought to you every day. Presented by Mark Coles. On today's programme: American artist Jim Shaw, the impact of Amazon publishing on traditional booksellers and publishers and Senegalese kora player Seckou Keita. Image: Jim Shaw - Capitol Viscera Appliances mural 2011 Courtesy the artist and Simon Lee Gallery, London/Hong Kong. Image: Untitled (Faces in circle). The new book by Timothy Ferris, the best selling author of The Four Hour Week, is being boycotted by bookstores in the US because it’s published by Amazon. Professor John Thomson of Cambridge University discusses the potential impact. The latest album from this Senegalese kora player blends musical influences from around the world. He explains his love for his instrument and plays for us live in the studio.